The last couple of days have been a mishmash of seeing some recommended sites, walking the streets, seeing a play, visiting a museum and eating a couple of decent meals. I think I have lost a little steam recently and as our time here in England is fast coming to an end, I find myself thinking more and more of home. Or at least getting back into the good ol’ US of A. But even as I write that last sentence I need to pause and reflect on what a charming town York is. It seems that everyone we spoke to before arriving here had nothing but praise about this lovely town, and I can see why. 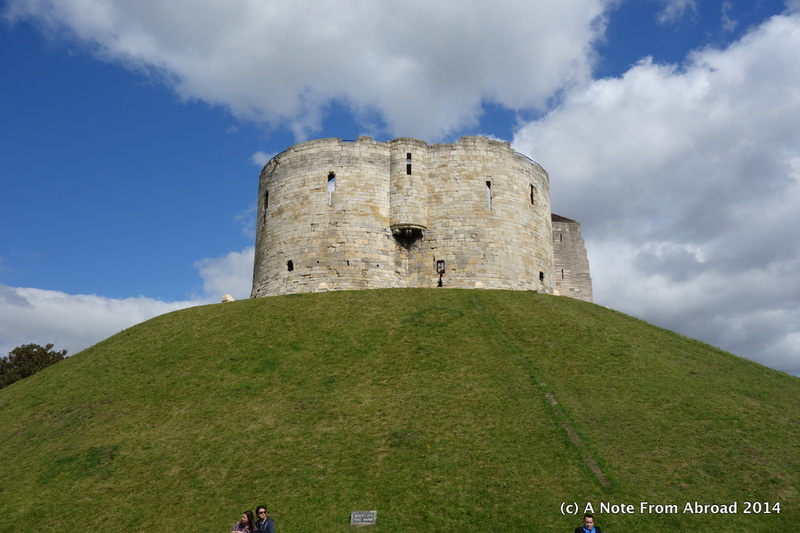 Right in the center of Old York sits Clifford’s Tower high up on a tall mound with steep grassy slopes. This is all that remains of York Castle which was built by William the Conqueror. 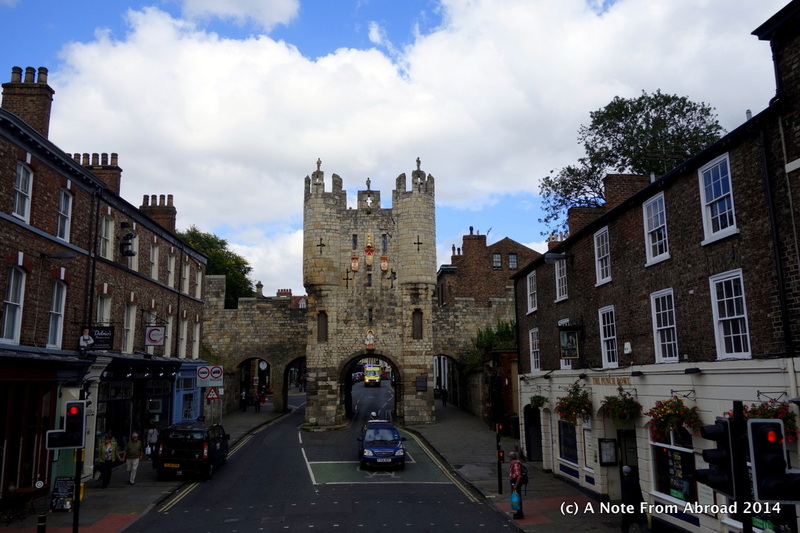 York was a walled Medieval city, and much of the ancient walls still remain as well as elaborate entry gates. In fact, according to Wikipedia, York has more miles of intact wall than any other city in England. Scattered about town at random places one can find a bright yellow bicycle attached to a wall or the side of a building. I’m not sure why, but suspect it has something to do with the Tour de France bike race that started here in Yorkshire Dales this year. 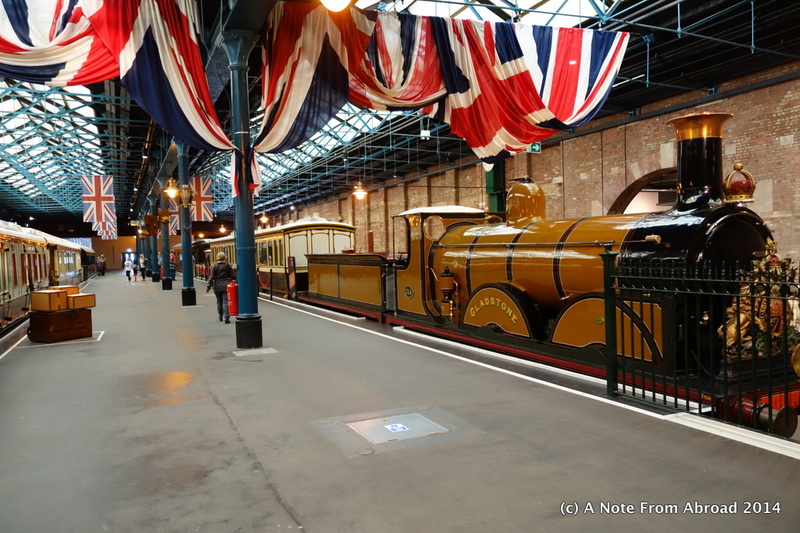 Our biggest adventure today was spending a couple of hours at the National Railway Museum. 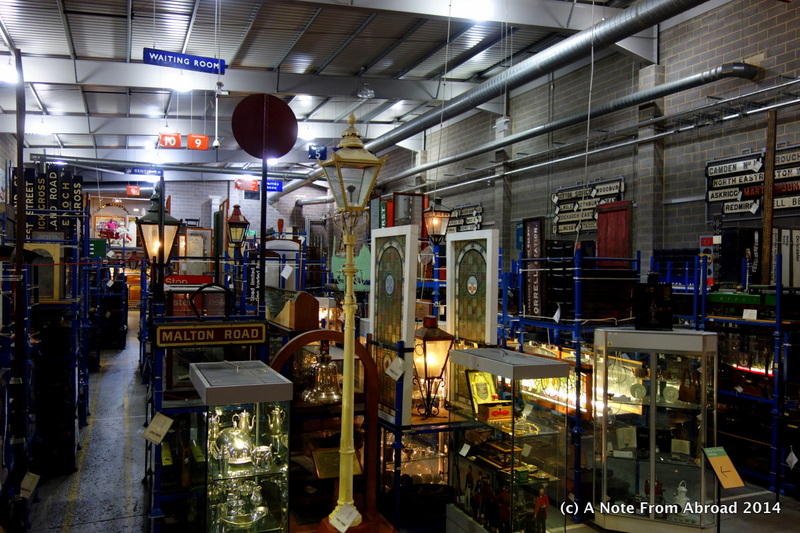 Their collection includes over one million objects from over 300 years of railway history. Tim’s eyes lit up like a little guy anticipating Christmas morning. It was wonderful to see him truly enjoying a museum, and not simply humoring me and/or sitting patiently waiting while I read one more sign or took another dozen pictures. And surprisingly I loved it too. 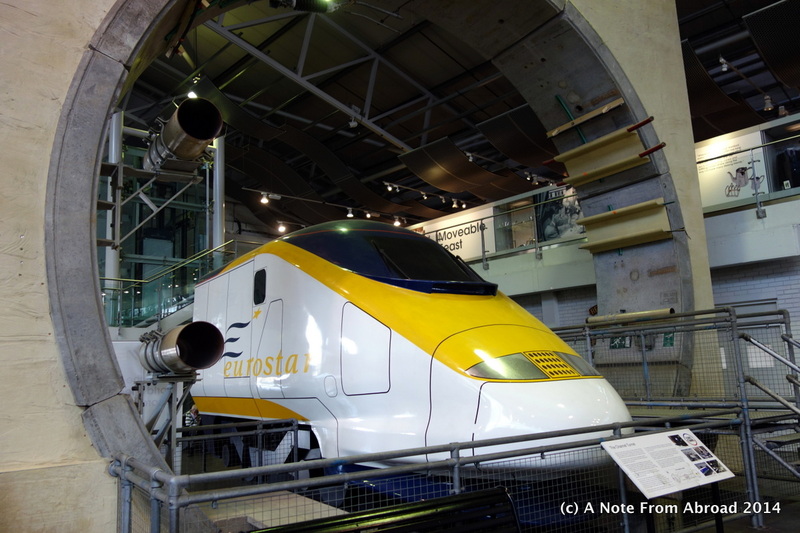 The museum is enormous and spread out over several large buildings as you might expect when dealing with something as large as trains. We allowed three hours and could have easily spent longer. York has all the ingredients of a small town to make you fall in love. Charm, beautiful architecture, history, easy to get around with good transportation, friendly people, free museums and plenty of good restaurants. I’m awfully glad we came! Gratitude Moment: Today I am grateful for YOU, the many readers that take the time to follow our blog, leave us messages, and encourage us to keep on sharing our trip. It means more than you know and I sincerely say THANK YOU! 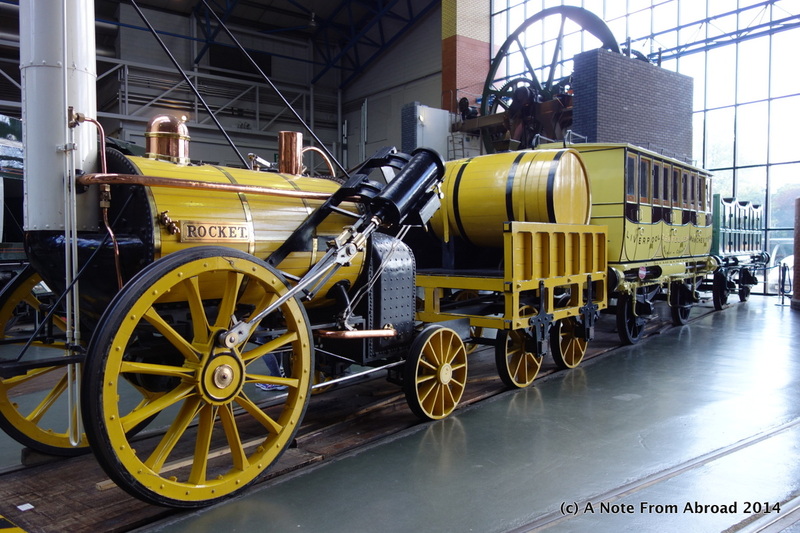 This entry was posted in England, Europe and tagged England, Museum, National Railway Museum, Photography, Trains, Travel, Yellow Bikes, York. Bookmark the permalink. 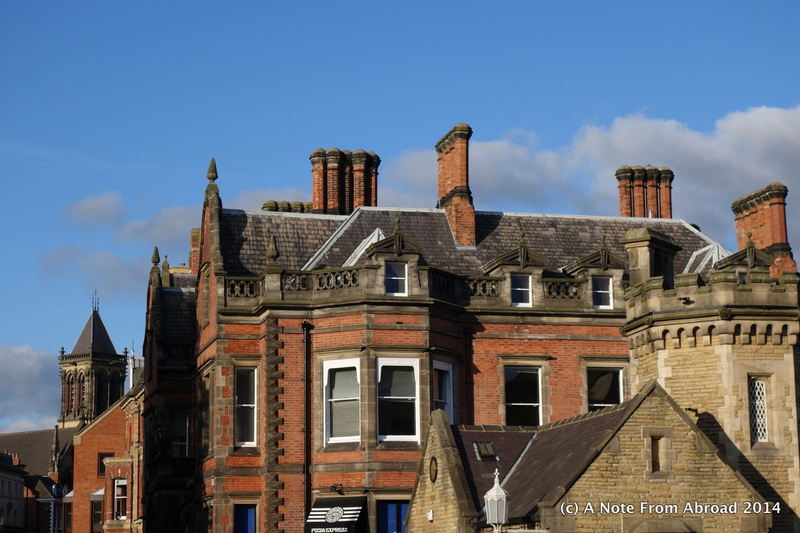 I had to go up to York last year on business and loved the City. My meeting started at 9:00am but I got up at 6 and walked around a section of the City Walls before breakfast. There were very few people around and in some parts I really felt as if I were back in medieval times. I can’t wait to go back! I am hoping to do exactly that tomorrow morning if I can drag myself out of bed early. Walking the wall and doing a city walking tour are the last two items on my list – oh, and doing laundry. Thank you for your sharing your wonderful journey you are on. I start my morning with you and a good cup of coffee. I love sharing your adventures with my 83 year old mother over the phone. She always ask where you are at now. She chuckles at some of the stories. Especially the food parts. Life is a highway..keep calm and travel on. Kathy, oh how you have made my day. I am envisioning your dear mother asking about us and I smile from ear to ear. Thank you for being a part of our journey and for sharing it. Hello Cam! How wonderful to hear from you. 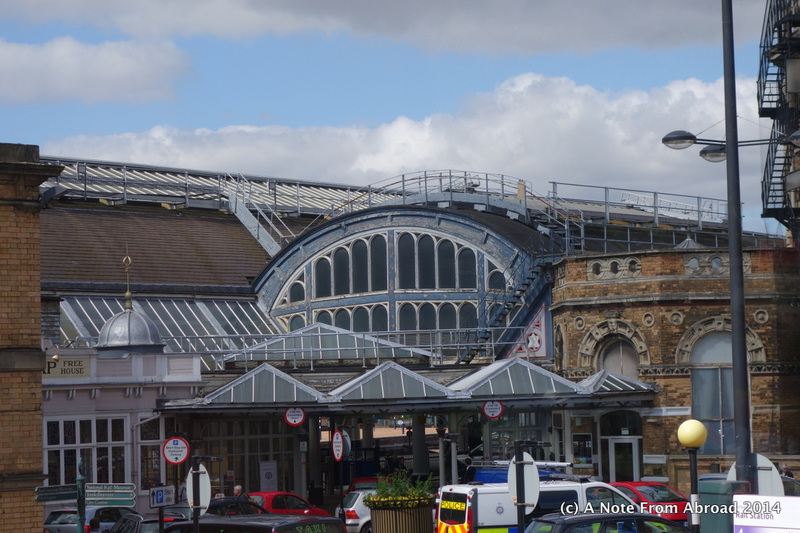 York has been one of those special stops that I will remember and talk about in the future. I’m so glad you and your family enjoyed it too. Hugs to you all! 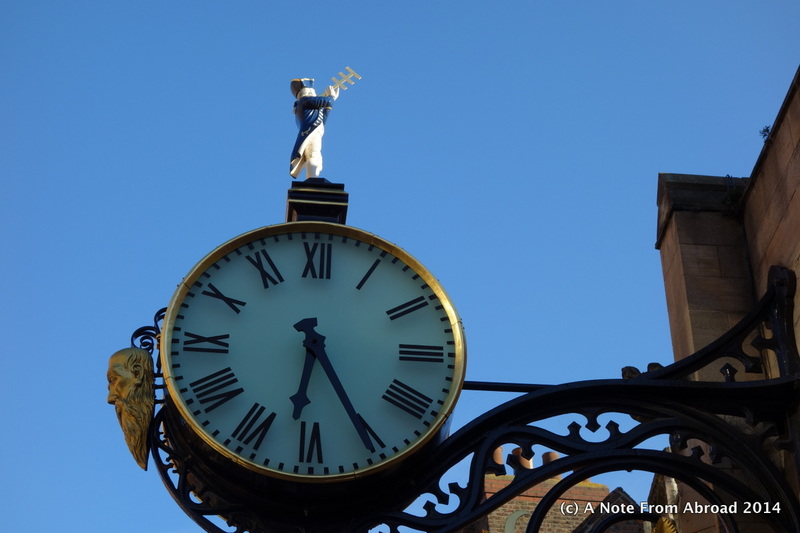 If you’re still there, consider making time for a visit to Jorvik Viking Centre. You’ll get to experience the sights (and smells!) of Viking-era York. It’s a hilarious, but also very educational, experience. Jen, thanks for the recommendation. We only have one more day here and not sure if we will get to it, but will certainly see if it is one we can fit in. 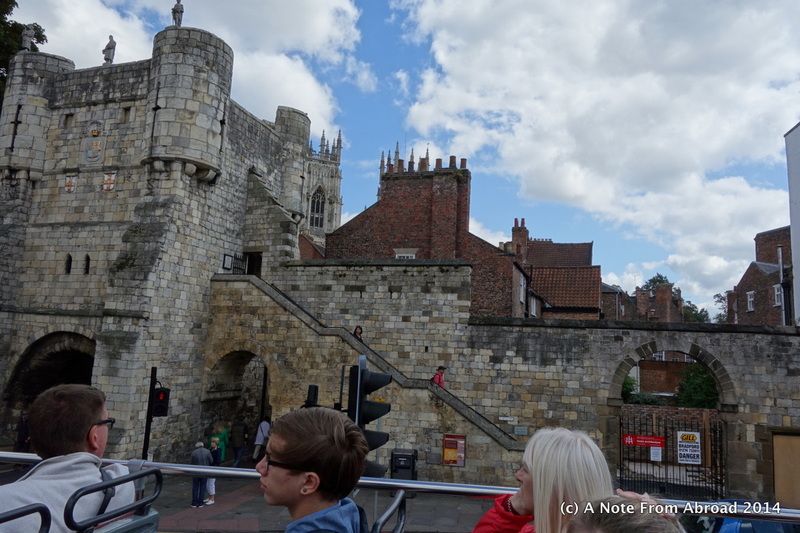 The medieval walls around York must have been impressive, and pictures, probably can’t capture the value of the architecture. Glad I could travel in your suitcase and see all the sights with you. Thanks again. We are hoping to do some walking on the walls tomorrow if the weather holds. Should be fun. I love all things old or ancient, so I love anthropology, for example. 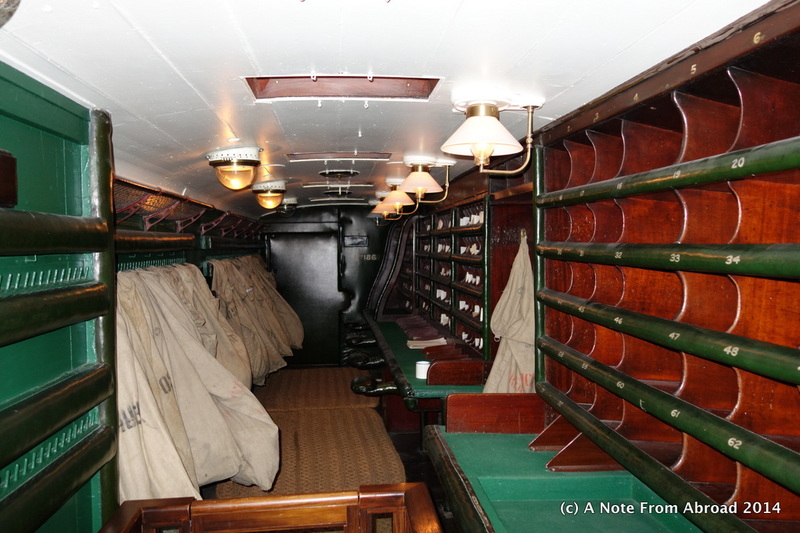 But as a master mechanic i have always loved anything old in planes, trains, and automobiles! 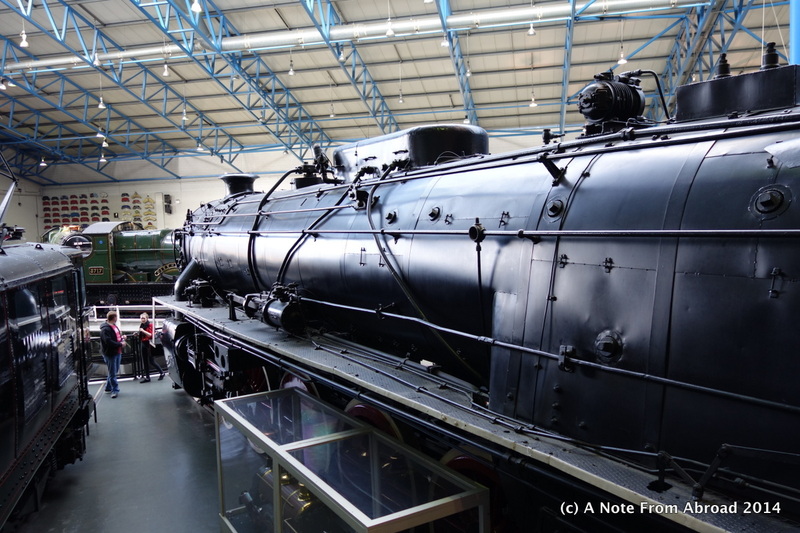 John, you would have been in heaven at the train museum. 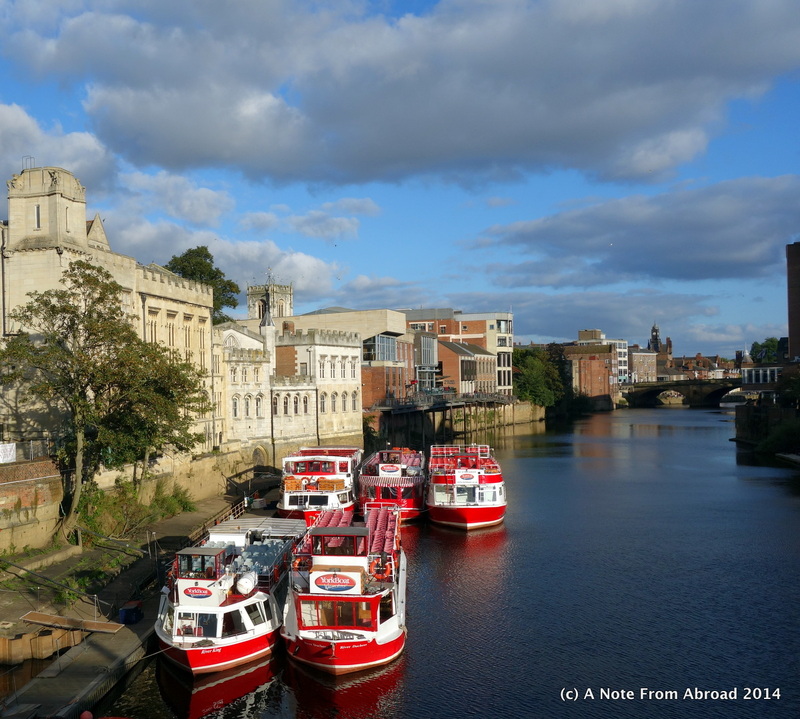 York looks like such a lovely town – I’m really dying to go back to England and explore more of the country beyond London. And I love all the yellow bicycles around town – how fun! Laura, there is so much more to England than just seeing London. And that is saying a LOT because I LOVE London.